Institches with Bonnie: Flash -- Snow? Pat was out and about for work today and sent me an email when he got back to the office. Some of the rain was really SNOW falling from the sky. Come on now, it is 2/3rds through APRIL! Give us a break. The local news said the latest measurable snow in the greater Scranton area was May 15th. I forget the year as I was so stunned with the date in May. I spent my time today getting the May block of the month ready for my guild meeting tonight. Here is my version of the block. I love the way the turquoise sparkles in these blocks. I've already got one quilt made with this block. 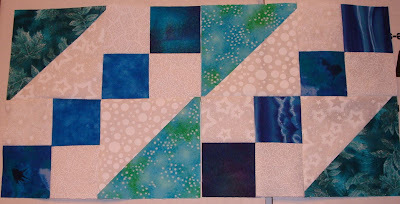 And, I've been making blocks to make a charity quilt using the same greens and blues I used for the lap quilt. Hum, I wonder if I have a scrappy turquoise quilt in the future? in NY, we had snow through the end of May in 2003. It was awful. I just checked the weather in Paducah, and it's going to be from 65-85 while I'm there. Why don't you come on down and join me? It was 97 today in Northern California! The heat is killing my beautiful iris. I'm so sad. What happened to spring? I love the colors in these blocks! We had snow last year just before we moved in the middle of April but I think we're done for the year.